Twenty journalists, including four foreigners, are facing charges in Egypt, prosecutors have said. The Egyptian journalists are accused of belonging to a “terrorist organization” and the four foreigners are accused of assisting it, or spreading false news. The defendants include two Britons, a Dutch national and an Australian – believed to be al-Jazeera correspondent Peter Greste. Earlier, international news networks called for the release of five al-Jazeera journalists. The 16 Egyptian defendants face several allegations including belonging to a terrorist group, harming national unity and social peace, and using terrorism as a means to their goals. The four foreigners are accused of collaborating with the Egyptians and providing them with information, equipment, and money as well as broadcasting false information and rumors to convince the international community that Egypt was undergoing a civil war. Eight of the defendants are in detention, while 12 are on the run with arrest warrants issued against them, according to the prosecutor’s statement. No names are mentioned. But it said the four foreigners were correspondents for the Qatari al-Jazeera news network. “We only know of five people in jail,” said al-Jazeera’s head of newsgathering Heather Allen. 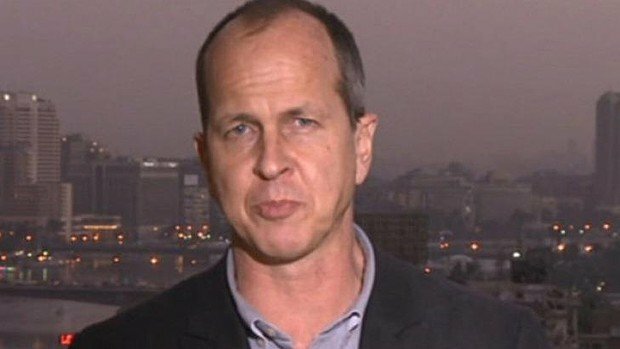 Peter Greste’s appeal against his detention without charge was denied on Wednesday by a Cairo court. The staff members and journalists of al-Jazeera were arrested in late December following interior ministry accusations of illegally broadcasting from a hotel suite. Al-Jazeera has said the men were merely reporting the situation in Egypt. Of the three arrested a month ago, Peter Greste is accused of collaborating with “terrorists” by talking to members of the Muslim Brotherhood, which has been banned by the military-backed government. Al-Jazeera Cairo bureau chief Mohammed Fahmy, who is Egyptian-Canadian, and Egyptian producer Baher Mohamed are accused of the more serious offence of membership of the Muslim Brotherhood. The al-Jazeera network says it was “surprised” when its reporters were arrested by Egyptian authorities. Two more of its staff – journalist Abdullah al-Shami and cameraman Mohammad Badr – were arrested in July and August.